November’s Blue Wave didn’t only take place on a federal level. Democrats flipped hundreds of state legislature seats, including in New York, where they took control of the Senate for the first time in a decade. Now, the activists across the state who got those politicians elected have turned their attention to holding them accountable. Despite huge voter margins, this is only the third time over the past 50 years that Democrats have won the Senate, which they’ve controlled for a total of less than three years since World War II. But now the party has a trifecta of control over the governorship and both bodies of the state legislature. The change means progressive activists have a new opportunity to demand their representatives make good on the progressive promises that got them elected. Outsiders unfamiliar with New York politics might be surprised to learn that the state, often painted as a Democratic stronghold, has had such a rightward lean in state politics. That’s thanks in part to the IDC, or the Independent Democratic Conference — a rogue group of Democratic senators who formed an alliance with Republicans to gain benefits for themselves and their districts. Though the IDC formally ended in April of 2018, activists were still angered by the years of watching progressive legislation stall. The divide in the legislature had given Governor Andrew Cuomo cover for his lack of action. The governor, who calls himself a “pragmatic progressive,” is known for being averse to fiscally progressive reforms, but he used the IDC and a Republican-controlled Senate as an excuse to lower expectations. Voting groups and community organizers channeled their frustration into two sets of political victories — they won primaries that ousted IDC-esque Democrats from their seats, and then won a second round against Republicans in November. Now, with a blue majority, activists are demanding their politicians adhere much higher standards. 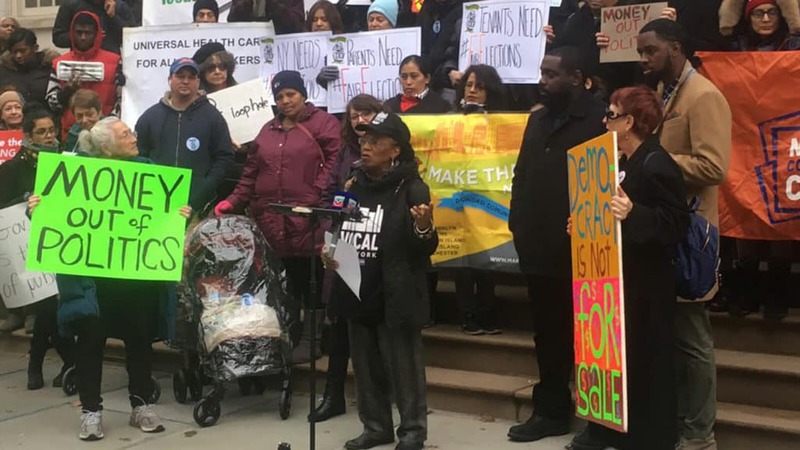 VOCAL-NY is part of a broad coalition of groups demanding newly-elected politicians take swift action on the progressive measures that have stalled for so long in Albany. It’s a big tent, connecting newly-activated voting groups with community organizers and grassroots movements who’ve been pushing for progressive change for years. Together, they’re creating the People’s Platform — a broad set of demands that includes everything from fair tax measures to codifying reproductive rights to ending mass incarceration. The People’s Platform is very much a living document, Saunders says, rather than a static list of demands. “We came up with a basic slogan — that we wanted money out of politics and we wanted money into communities.” They’re working from that premise to create a concrete set of goals, beginning with campaign finance reform and progressive tax policy that puts more money into public coffers to deal with problems like the record-high homelessness, poverty, and drug overdoses that are pervasive across the entire state. The coalition is also keeping a close eye on policy to make sure that the final results don’t get watered down. One key example is coming up this week as legislators vote on a bill to expand voting rights. The bill includes important measures to increase access to the ballot, like same-day registration and early voting. But groups like VOCAL-NY are pushing them to restore the right to vote for people on parole — an important provision they expected to see, but was missing from the final bill. Though Cuomo issued an executive order extending this last year, activists are hoping to codify the right through legislation. As Saunders points out, activists in New York have some recent examples of using movement energy to demand accountability from state politicians. Democrats were able to pass a string of important legislation during one of their short windows of control about a decade ago, including reforms to 1970s drug laws, an end to prison gerrymandering, and a tax increase on high earners. When the tax increase was set to expire at the end of 2011, activists — many of whom were from the growing Occupy movement — demanded they continue on despite Cuomo’s opposition. If it weren’t for Occupy Wall Street, Saunders says, Cuomo would’ve nixed that tax increase. He thinks the current political moment is similar, especially given the new energy among activists across the state. Now, their job is to build a united front. The coalition is kicking off with demonstrations to bring together the activists among their ranks and to promise the new crop of politicians that the progressive energy that got them elected won’t dissipate anytime soon. The group announced their demand at a December demonstration in New York City. On Tuesday, they’ll go to Albany to make sure those demands are heard by their new representatives. “All of this is part of our process for building something that is bigger and stronger,” says Saunders. The process for that comes by using all of the natural strengths of the organizations within their coalition — for example, having voter groups engage community members to target elected officials, while grassroots membership organizations can continue their direct actions and lobbying efforts.